There was the great room, and its rug that crawled with men in Persian headdresses who hunted wonky, pointillist tigers across its nap. There was a seemingly endless succession of black labs named Zach, along with the training whistle on its lanyard and the dummies that we could go out and throw for them as long as we made the dogs wait and sit as if they were really hunting. There were all the Ducks Unlimited stamps in the picture frames along the hallways. There was the kitchen that never once in my life had the utensils I needed to finish cooking a meal, a laundry room that felt secret and detached from the rest of the house, the horse barn, and the cast iron lawn statuary from decades past. And in the end there was a hospital bed in the living room, the whir of the oxygen tanks, night nurses, and an old man whose hand shook when I held it and couldn't recognize me any longer. My Grandpa Jim passed away after a short bout with cancer. The weeks from Christmas to the beginnings of March were a fast, dirty slide towards the finish line. Given how painful his final weeks seemed I can only stand by the aphorism that it was quick, though as always it was far too quick for those who remained behind and likely not quick enough for the man who had to suffer through his illness. Family is complicated. When I was twelve or thirteen my dad told me you don’t have to like family at all, but by God you have to love them. Family means sitting around the Thanksgiving table listening to someone say three indefensibly offensive things in a single breath and close with an old family joke that breaks up the whole table into laughter. And in that moment you don’t forgive them, not really, but you’re willing to shrug and try to forget those things. Family means tying yourself into knots to care for someone with dignity, respect, and love even when it tears you to pieces. Family means a son reaching his unconscious father’s hand out from the bed and down to a yellow lab for one final pet before saying goodbye. Family means looking at all the stuff, the furniture, and clothes, and the house itself, and realizing that in the end it doesn’t mean a God damned thing, but even so you’re worried about what will happen to a wedding ring, a favorite bird gun, or a worn out baseball hat. Family means loving people even though you’re not always sure why. I didn’t learn the outdoorsy parts of my life from my grandpa, but he gave me the space to find them. All of it, the camping, hiking, fishing, cycling, every moment I spend out of doors, is rooted in summer trips to the family cabin outside Steamboat Springs. My grandfather gave me a childhood filled with trees and mountains. Would he have said that? No, of course not. 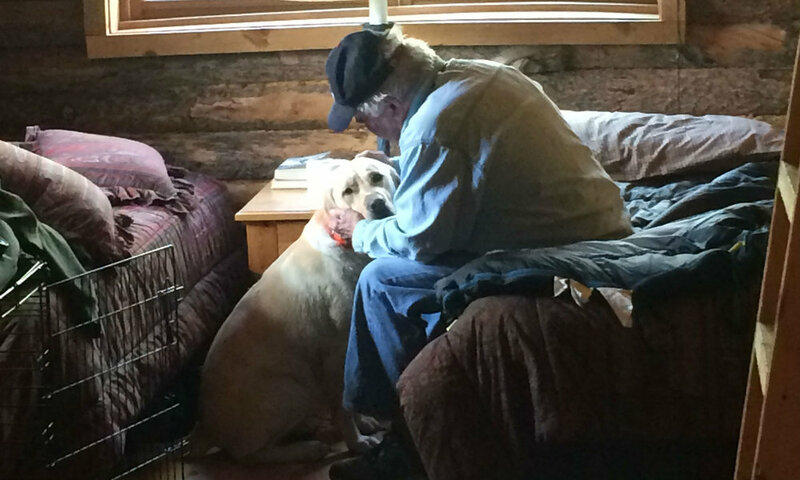 He just liked having a place in the mountains where he could go on the weekends and split wood, tend the fire, and relax with his dogs. When I came back after spending days on the small trout stream that runs through the property he always wanted to know how I did, how many I’d caught, what the river looked like right then. I know for a fact that we did not see eye-to-eye on most things, that my politics were a concern, and so on. But I think that he, a Ducks Unlimited member since he paid his first membership dues with paper route money at the age of nine, recognized passion, and engagement, and the maddening, compelling, unquenchable needs of a fellow traveler and sportsman. The man who used to wake up well before dawn to sit in a duck blind in the damp Midwestern cold understood perhaps all too well why I came home late, why I simply had to fish around the next bend, and why I had to sneak in just one more cast. The cabin he built is filled with ghosts. We step around, and over, and through them. In the leather armchair in the corner, the one beneath the lamp with the good light from the west-facing windows, my grandmother still sits reading gossip magazines, tapping the ashes from her long, skinny Eve cigarettes into the brass ashtray by her elbow. My sister Mackenzie runs back and forth across the loft above the bathroom, the hollow thumps from her feet attenuated by time and the too-human nature of memory, but still loud when you listen. She’s climbing up the ladder before jumping back down again to start over. At six, nine, twelve, and eighteen, but no older than that, mirror image versions of her wander through the living room, flop on couches, or stop and stare at her framed picture above the fireplace. At the long cafeteria table my grandfather unrolls a tattered USGS map and anchors the corners with whatever’s at hand. There’s blue-checked oilcloth on the table, fresh coffee in the pot, and a long, scuffed bench tucked under each side. As he stands over the table, constantly stepping around his own shadow from the overhead lamp, he’s ready to start over, to build a fence, to plot a line across a hillside, fell timber, and build something, by God, that was his and his alone.